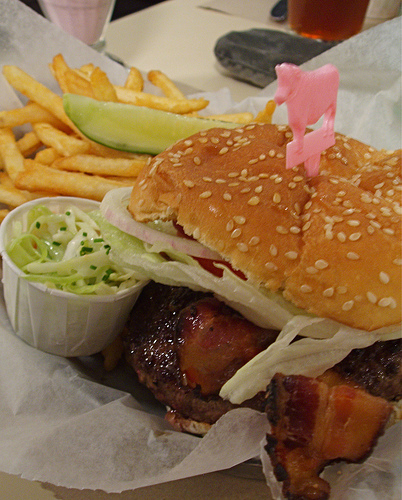 The BLT Burger from BLT Burger – I love burgers. Call it one of those childhood fixations that I never grew out of. I do have an informal quest to find the ultimate hamburger experience–the moment of tucking in that leaves you forsaking all others and begging for more. So when in the country that may have perfected the hamburger, how could you not eat at least one during a visit? Part of the growing restaurant empire of Chef Laurent Tourondel, BLT Burger is his homage to this icon of food Americana. The restaurant itself is pure American diner kitsch. An amazing facsimile of a hole-in-the-wall, old-style diner punctuated by a stuffed head of long-horn steer mounted on the far wall just in case, you forget what they serve at this restaurant. Vegans need not enter. As for the burger, let me put it simply, it is heaven. It has the all classic fix-ins: the circular slices of onion and tomatoes, leaves of fresh iceberg lettuce and of course the crispy cuts of American bacon, stuffed into a sesame seed bun. But the star of this hamburger is a patty that combines ground beef sirloin, brisket, chuck, and short rib, grilled to char on the outside and a moist medium rare on the inside. Once you bite into it, the beef melts in your mouth, releasing its flavorful juices that would make a grown carnivore cry in beef ecstasy. The Union Square Farmer’s Market – If being a foodie was a religion, the Union Square Farmer’s Market would be our church. As any home cook or professional chef will tell you, a great dish always starts with best-quality and freshest ingredients. 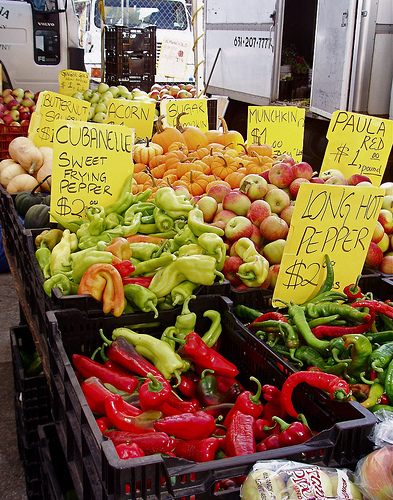 They don’t get any better than what is available at this open-air market. Heirloom tomatoes as small as walnuts to as large as a newborn’s head. Varieties of apples more numerous than I thought possible. Fruits and vegetables of all sorts that I had only read about in cookbooks. Unusual meats like bison, ostrich and venison for the buying. Organically raised and grass-fed beef and lamb. Flowers, plants, cheeses and breads. Frankly, all this variety made this food lover a bit lightheaded with glee. 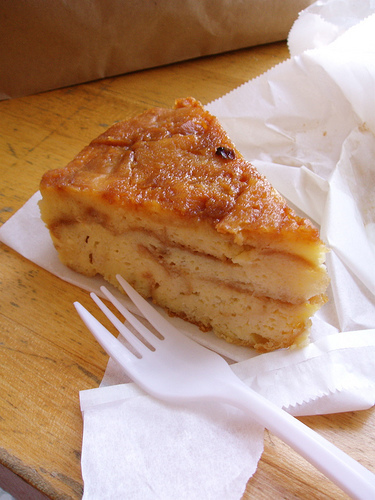 Bread Pudding from Grandaisy Bakery – While shopping for yarn in SoHo (A is a devout knitter and obsessive yarn collector), I realized that we were on Sullivan Street. The same Sullivan Street where the aptly named Sullivan Street Bakery is located. This much loved, community based bakeshop is well known for creating some the best Italian breads and pastries in New York. But due some internal changes, what was once the Sullivan Street Bakery is now called Grandaisy Bakery. Owned and operated by one of the original owners of the Sullivan Street Bakery, Monica Von Thun Calderón and her talented bakers have worked hard to maintain the same standards that made the original bakeshop famous. This unassuming bakeshop can be easy to miss. We got lost looking for it. But once we found it, it was like walking into a bread dreamland. Among the vast array of breads, pizzas, pies and pastries, what caught my eye was a modest-looking bread pudding sitting in a glass display. A baker tells us that it is very popular and her personal favorite. With a ringing endorsement like that, how could we resist? We order a slice. Sitting at an unadorned counter, A and I dig in. Soft, moist and lusciously rich, the pudding is everything they say it is. Every bite is a deep custard flavor with a hint of sweet caramel. Every taste is unhurriedly savored as each forkful melts in my mouth. 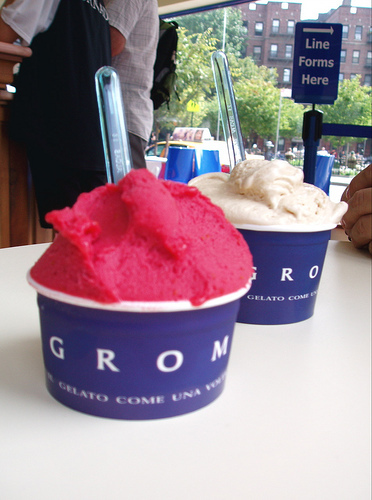 Gelati from Grom – It is no secret that I have thing for ice creams and gelati. So it should be no surprise that trying the local frozen favorites was on top of my to-do list. I tried a my fair share of ice creams and frozen desserts during my visit but place I enjoyed the most was a gelatteria called Grom. Grom prides itself for providing the very best by using unique and flavorful ingredients to create some of most delectable gelati and sorbettos I have ever had. After a couple of disheartening tries, we finally made it to this delightful European import. We sat down and tried two flavors: a Carmello gelato – a bitter-sweet caramel sugar gelato made with pink Himalayan salt and the Lampone sorbetto – a sorbet mixture of rich heavy cream and tangy raspberry pulp from the valleys of Moncheni, Italy. As A and I sat in this corner gelatteria, eating these cups of delectable delights, we looked out bustling streets of the East Village. We took pause and agreed. This was a moment to remember. This post is making me crave a trip to NYC for a culinary vacation of gluttony! Thanks for sharing your NYC faves and I hope to check them out on my next trip there! Hi ragamuffin girl. Absolutely Yummy. :)If you have the time and the will to walk. NYC is amazing town to do some food exploring. There's seriously just too much to eat and try out in NY! for food, i will make time and i will walk. haha! hope you visit HK soon, let's walk and eat and walk it off and eat some more. Hi wysgal. I know. I had a to-do list as long as my arm. I barely did everything I wanted. Everything looks so damn good!! I want to go to NY! !